Michael Hobbs, FOMP Secretary, East Lake Washington Audubon representative. The trail is currently in the design development phase. Last week they met with Parks to discuss status. The team have submitted various permits already, with others to be submitted on December 5th. The trail alignment has been all-but-finalized. At the east end, cost considerations and permitting considerations resulted in a choice of a short boardwalk. This causes the trail alignment to conflict somewhat with the model airplane field . Cost for the boardwalk is around $1000-1200 per linear foot. K.K. Soi proposed some mitigation along the lines of placing poles or trees (at least psychologically) protecting the trail from errant airplanes. Herb was skeptical that a true safety barrier could be constructed, but trees and/or poles with banners would indicate to fliers to stay away. Herb also proposed billboard style signs, perhaps attached to the boardwalk – alternating red and white squares in a 2x4 checkerboard. Three alignments of the boardwalk were investigated. The shortest and southernmost is currently planned. The middle alignment is 60 feet longer, and the northernmost alignment is 180 feet longer than the southernmost. In terms of mitigating the conflict, one possibility is to rotate the runway by 8-12 degrees. An 8 degree angle shift would require about 9000 feet of new runway area, which might require some fill. A 12 degree rotation would require 14400 square feet. Rotation considerations would also need to look at the effect on the west end of the flight zone. If fill is required, that would probably lead to additional wetland delineation work, and possibly expensive permitting. A 5-degree shift should also be considered. Changing away from the southernmost alignment would cost ~$60,000 in additional construction cost, but repermitting delays would prevent 2008 construction. So the decision is that mitigation rather than realignment is how they will proceed. Site construction might begin in August 2008. Fire alarm system will be upgraded along with lighting. Adding a security system is under consideration (anti-vandalism). Project will hopefully be completed February. This is putting synthetic turf onto these fields. It will be done as a multi-use field, which can be configured either as two ballfields or two soccer fields. Michael did point out that migratory, tundra-nesting geese (mostly Cackling Geese and Canada Geese, with occasional Greater White-fronted, and even Snow Geese) use the mowed fields for forage in the winter. Conversion of too many of Marymoor's fields would eliminate this winter forage site. Steve presented their latest siting plan for the new rowing club building replacing the old one in Marymoor West. The new building, whose footprint is significantly (~2.5x) larger than the old one, would sit on the upstream (south) side of the access road about 125 feet further inland than the current building. A new paved apron would be built on the riverside end of the boathouse with a paved roadway connecting the new apron to the pad from the existing building. Since the new paved apron would connect to the access road, the new apron, connecting roadway, old pad, and old apron combine to form a turn-around suitable for fire equipment. The siting would preserve a large clump of cottonwoods that are located between the old and new building sites, but would about a dozen Oregon Ash trees as well as a couple of large, old plum trees that probably date back to the days when this area had farm houses. The new building site lies about 5 feet lower than the access road; fill would be brought in to raise the foundation above the access road level. Fire officials would require the widening of the access road from about 50 feet before the new boathouse all the way to the existing paved apron. The existing boathouse building would be removed following construction, but its pad would remain as indicated above. A fuel tank would be placed approximately where the existing fuel storage shed is located, on the river side of the old apron. Steve indicated that a shed might be built to hold their motorized launches (coaching boats) somewhere closer to the water than the new building. That's not been decided. The new boathouse was designed to have room for the launches inside. Michael expressed disfavor with the siting. There is an open field on the downstream (north) side of the access road where essentially no trees would need to be removed. The proposed siting is very close to a seasonal pond and is entirely on top of an area that was recently (2005?) planted as part of wetland restoration activities. Steve acknowledged that there would be significant mitigation work required because the proposed site lies inside wetland buffer. Enterprise Group tries to generate revenue on the order of 25% of Maintenance & Operations costs of the park system. Going beyond commercial partnerships, they are now turning to private donations. This would be done through the 501.c.3 Northwest Parks Foundation. They are looking to both corporate and individual fundraising. Donations cannot be earmarked to a particular park at this time. Money goes to M&O for the park system as a whole. There was definite feedback that designating funds should go to a particular park was desired. Christine requested getting the fund listed on the state employees annual giving program (and for county employees). There was discussion of memorial benches and plaques, which are mentioned in the Legacy brochure. Greg remembered that there had previously been discussion at FOMP that memorial benches etc., if proliferated in the park, could make it look like a cemetery. Pearson said that benches in Marymoor are currently being discouraged. Memorial trees, maybe with memorial tags, would be fine, though. 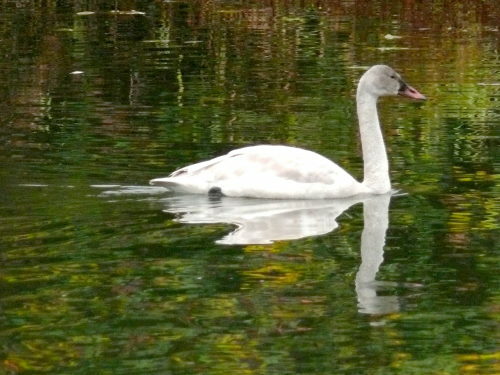 Michael mentioned that a juvenile Tundra Swan has been hanging out in the slough. This was a new bird for the park list, which now stands at 201 species since 1994. For more information about birding at Marymoor, see http://www.marymoor.org/birding.htm and check out the Bird Blog. Next meeting, Wednesday, January 23, 2008.